Four seasons of excavations were conducted at Tel Gezer in the summers of 2006–2009 (License Nos. G-48/2006, G-56/2007, G-57/2008, G-51/2009; map ref. 19248/64073). 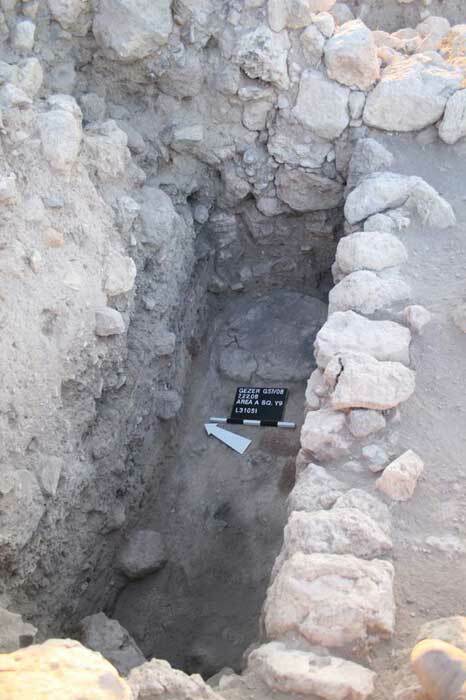 The excavations were undertaken by Southwestern Baptist Theological Seminary and the Israel Antiquities Authority; additional support was recieved from a consortium of institutions: Ashland Theological Seminary, Marian Eakins Archaeological Collection, Clear Creek Baptist Bible College, Lancaster Bible College, Lycoming College, Midwestern Baptist Theological Seminary and New Orleans Baptist Theological Seminary. The excavations were directed by S. Ortiz and S. Wolff, with the assistance of G. Arbino and E. Braun (field supervision; Braun, 2007–2008 seasons), E. Mitchell (Gezer regional survey, 2007–2009), T. Hofecker (administration), D. Cole (volunteer coordination), A. Applebaum (conservation and registration, 2007 season), H. Reichstadt (conservation, 2008–2009 seasons), J. Rosenberg (surveying and drafting), G. Arbino (field photography, 2006–2007 seasons) and S. Wolff (field photography, 2008–2009 seasons), Sky Balloon company (aerial photography, 2006–2007 seasons) and Skyview (aerial photography, 2008–2009 seasons), D. Pride (computer specialist), J. Harrison (registration, 2008–2009 seasons), D. Hofecker (pottery registration, 2006 season), E. Shaposnick (logistics), T. Asamain (field conservation/restoration, 2008 season) and A. Yogev (field conservation/restoration, 2009 season), O. Shorr (pottery restoration, 2007–2008 seasons) and M. and J. Ben-Arie (pottery restoration, 2009 season), R. Vinitsky (metallurgical laboratory) and C. Amit (studio photography). Additional assistance was provided by L. Kolska Horwitz (faunal assemblage); O. Marder (flint assemblage); B. Brandl, S. Münger and T. Ornan (glyptics); R. Kletter (figurines and weights); K. Miller (numismatics); P. Mountjoy (Mycenaean pottery); R. Merrillees (Cypriot pottery); and G. Finkielsztejn (stamped Rhodian amphora handles). Support was also provided by a team from Tel Aviv University (I. Finkelstein and S. Weiner, principle investigators), sponsored by the European Research Council. The excavations, located within the Tel Gezer National Park, received the cooperation of the National Parks Authority (T. Tzuk, head of archaeological branch and O. Harari, regional inspector) and support from Qibbuz Gezer, Pinat Shorashim and the Karmē Yosef Community Association. The project, affiliated with the American Schools of Oriental Research, received assistance from S. Gitin, Director of the Albright Institute. The expedition was housed at the Newe Shalom Guest House. The excavations were conducted in Areas A and B in an attempt to understand the archeological remains west of the so-called ‘Solomonic’ or ‘six-chambered’ gate (R.A.S. 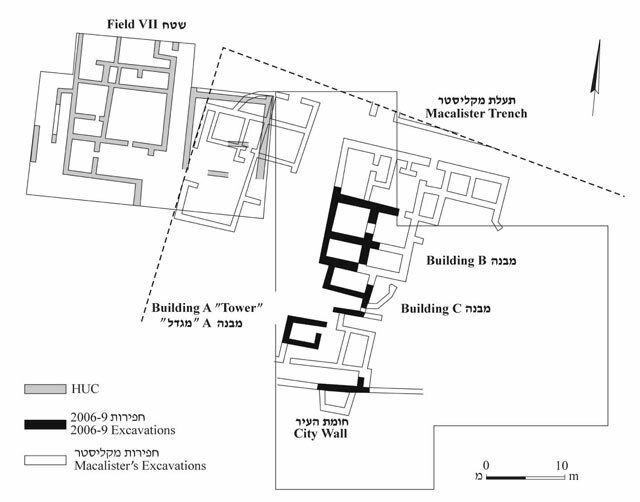 Macalister’s ‘Maccabean Castle’; Hebrew Union College’s Field III) and east of HUC’s Fields VII and X, which included the casemate wall system and ‘Palaces 8000 and 10000’, both partially excavated by Macalister and W.G. Dever (1985, 1990). 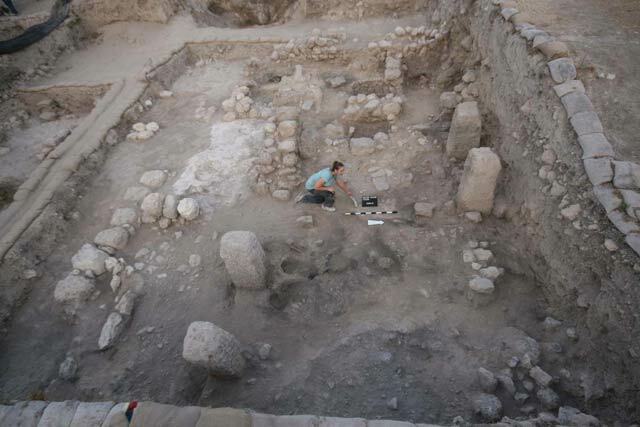 Remains from the Middle Bronze Age and Iron II fortification systems were exposed as well as Iron II public buildings, and private buildings from Iron II and the Hellenistic period. Fortification Systems (Fig. 1). Four excavation seasons have significantly increased our understanding of the fortification systems to the west of the so-called ‘Solomonic’ Gate (HUC’s Field III). These systems extend along and south of the Iron II casemate wall line. MB II Rampart and Glacis. A stone glacis (L31044; height 9 m, gradient c. 15º) was uncovered at the lowest excavated levels of the slope of the tell. This stone mantle consists of small boulder-sized stones and covers a rampart that extends south of the Iron II fortification walls and its gradient is steeper toward the east. These stones were exposed for a length of 10 m from east to west, and may continue to the east and west of our excavation area. Near the highest part of the glacis and integrated into its steepest portion is a section of a wall (W41047; length more than 6 m) that extends eastward into the balk. This wall is preserved three courses high and is built of boulders and cobble-sized stones; its width remains undetermined and its function is uncertain; it may have stabilized the glacis, or served as the base for a tower that was contemporary with the glacis. The stone glacis was founded on a rampart composed of dike and fill layers of alternating plaster and soil. Only the uppermost two layers in this sequence were excavated. This type of rampart construction has already been discerned at Gezer, although no other rampart had a stone glacis. The southern edge of the top plaster layer in the sequence (thickness 15–20 cm) meets the top stones of the glacis. The plaster extends east–west for at least 15 m, although its traces are more patchy toward the east, and then continues northward from the glacis for at least 3 m as a flat plaster 'cap' to this fortification system (L31054). A short wall section (W41067; length 1.3 m), built of two courses and three rows of small unhewn boulders, was uncovered above this plaster cap. Its function remains enigmatic. A small probe (1 × 1 m) into the sealed locus below the plastered cap yielded only MB II pottery, thus dating the entire structure to that period. Iron IIA Glacis and Retaining Walls. A second stone glacis (L11063) that rested directly atop Late Bronze/Early Iron I destruction debris was uncovered. It extends from the western edge of the excavations, over 15 m eastward and c. 10 m southward, with a 1.3 m drop in slope. At the southern edge of this glacis, the stones end in an uneven and erratic edge that drops vertically 1.6 m to the level of the MB II glacis below. This would appear to indicate that the stones of the Iron II glacis were robbed, either in antiquity or during modern excavations (Macalister). The stones of this glacis are smaller than those of the MB II glacis. The stones in the northern portion of the Iron II glacis merge into a system of retaining walls and crib walls that was exposed for a length of c. 25 m. The system includes nine crib walls, more or less evenly spaced, fronted by low retaining walls to the south. It angled upslope and supported a wall system above it. Similar walls were noted in earlier excavations at Gezer conducted in contemporaneous fills to the east of the six-chambered gate (cf. BASOR 262). Several storage-jar stoppers/plugs were discovered in the deep contemporary construction backfill within one of the chambers created by this system. One of these stoppers bore an Egyptian stamp typical of the so-called 'Early Iron Age Mass-Produced Seals' (EIAMS) series, dated by some scholars from the twelfth/eleventh to the early tenth centuries BCE, and by others, to the mid-tenth century BCE, thus dating the glacis and retaining wall system to late Iron I or early Iron II. The crib and retaining walls of this unit were built upon LB destruction debris. A probe into this LB level yielded a large, round in situ pillar base (L31071; diam. 0.85 m; Fig. 2), which would appear to indicate the presence of a monumental LB building. Exposure of this building will be a primary focus in future seasons. Iron II Casemate Walls. Three complete casemate rooms of the casemate wall system, already known from previous excavations, were re-excavated, thereby enabling us to produce an accurate plan. The casemate rooms (c. 1.5 × 5.0 m each) were separated from each other by divider walls (width c. 1.5 m); all chambers were devoid of finds, most likely having been removed by Macalister. The founding levels of the walls rise as the system moves upslope to the west. Some 30 m west of the gate structure, the nature of the wall system changes. It appears that the original wall was breached in antiquity and was rebuilt on a slightly different line and seemingly not as a casemate (see below). The outer casemate wall disappears at this point—there is no clear end or corner. The broken western end of the outer casemate (W11087) rests directly on top of the easternmost crib wall, indicating that the crib and retaining-wall system along with its glacis should be understood as the foundation construction phase of the casemate system, all of which were built in late Iron I or early Iron II. The original length of this casemate system in its first phase from the gate westward cannot be determined with certainty. Rebuilds. The inner wall of the casemate system (W11081) was breached about 30 m west of the gate and subsequently rebuilt, likely more than once. The extant rebuilds consist of a single wall of one–two rows of large boulders (W11083). A burnt yellow mud-brick construction fill was exposed beneath it; this fill layer also lies underneath nearby Iron II (eighth century BCE) construction. Thus, at least this section of the rebuild should be dated to this phase. Shifts in the inner wall line, as well as earlier material observed under the stones in another section of the wall, lead us to surmise that other rebuilds of this wall may well belong to additional Iron II phases between the casemate phase and the eighth century BCE phase. A later rebuild occurred in the Hellenistic period. Public Buildings (Dever 1985, 1990; Area A north of fortifications). A series of public buildings (Fig. 3) was constructed west of the six-chambered gate and up against the northern face of the casemate wall. The following structures, from the gate, oriented east–west, were exposed: a 'soldiers' barracks’ (Dever, IEJ 35 ; a large, pillared square-shaped tripartite building (our Building A; eastern portion of Dever’s Palace 8000); a second tripartite building (Building B; western portion of Palace 8000); and a third structure (Building C). Most of the features in these squares were originally exposed by Macalister and, to a lesser extent, by Dever. Our excavations merely allowed us to define the foundations of several of the walls and to redraw the plan. Building A. This square, tripartite building (c. 15 × 15 m) has two rows of central pillars. All the surfaces and fill layers were removed by Macalister, with the exception of a cobbled surface that had a silo preserved in its northwestern corner. There may have been a courtyard between this building and the ‘soldiers’ barracks’ to the east, which abuts the western edge of the six-chambered gate. Immediately to the north of Building A, a pottery kiln, previously excavated by Macalister, was cleared. The building and the pottery kiln are most likely contemporaneous. Building B. This is also a tripartite building (c. 20 sq m) with long rooms, oriented north–south. The structure was extensively disturbed by the Hellenistic structures and by Macalister’s work. It apparently shares its eastern wall with Building A, although only a portion of this wall is preserved. It is clear that portions of this building were built upon remains of an earlier phase, as the western and northern walls bond to walls of earlier phases. Building C. Just west of Building B are the remains of a third public building, divided into two main sections. The central north–south wall of this building contains a worked square pillar, similar to those in Building A. Remnants of a cobbled pavement incorporate a stone-lined bin and the base of an olive/wine pressing installation, similar to others previously excavated at the site. Pottery collected from atop this pavement included a complete Iron II juglet and partially restorable vessels that provided a date for the building in the eighth century BCE. Iron Age Four-Room House. This building (Figs. 4, 5) consists of three long rooms (a central room flanked by northern and southern rooms), oriented east–west and separated by large limestone pillars (average dimensions 0.5 × 0.5 × 1.0 m), and a broad room to the west, which was subdivided into two smaller rooms by a transverse wall. The eastern and northern limits of the house remain unexcavated. 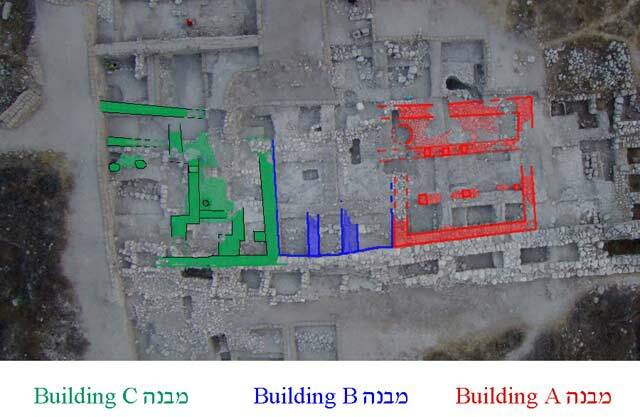 The estimated area of the house (135 sq m) is considerably larger than typical four-room houses previously excavated at Gezer and other urban sites. The building and its contents were sealed by burnt mud-brick destruction debris, testimony to a considerable conflagration (Fig. 6). 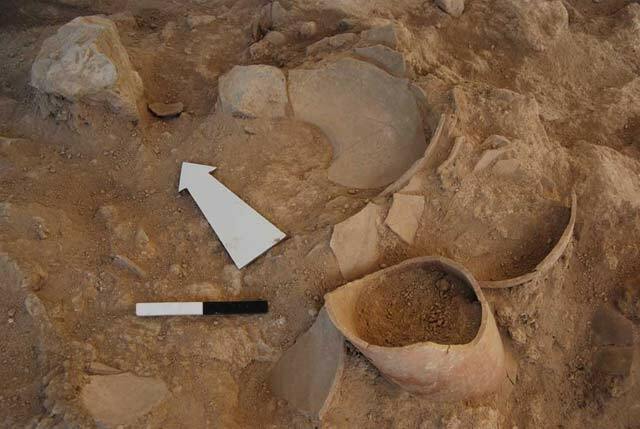 The portable finds from the building included basalt grinding stones, loom weights and a sizeable ceramic assemblage, consisting primarily of restorable storage jars of Phoenician types (crisp-ware, oval-shaped and others) and lesser numbers of bowls, kraters and cooking pots, but no jugs. The ceramic assemblage and small glyptic finds date to the eighth century BCE. The destruction is attributed to Tiglath-Pileser III’s campaign in 733 BCE. Evidence for a similarly dated destruction was found in the excavations of the nearby Field VII. To the south of the four-room house, remains of a cobbled surface (exposed area c. 3.0 × 6.5 m) were uncovered; it may be interpreted as a portion of a street leading uphill from the Iron Age gateway in the east toward the west. On this surface was a stone weight from an olive press, similar to those found in nearby Field VII. Two Ephemeral Phases. Two ephemeral phases were found, dated to the periods following the Iron II destruction. The lowest of these consisted of scattered architectural remains, including a silo and patches of a surface on which a stump-base lamp sat. The silo (preserved height c. 2 m), which cut into the four-room house (above), contained a complete Phoenician storage jar, other pottery vessels and a zoomorphic figurine, dating to the late eighth–seventh centuries BCE. The latest phase featured extensive pitting and at least three dog burials, which should probably be associated with fifteen dog burials discovered in Field VII. Hellenistic Remains (Fig. 7). The Hellenistic stratum yielded the remains of at least three buildings and a rebuild of the city wall. An extensive architectural plan is realized when these remains are joined to those exposed in HUC’s Field VII and Macalister. No floors or fill layers were preserved from this stratum; Macalister removed them all, leaving behind only walls and a deep backfill. The Hellenistic pottery recovered from the Macalister fills, which occur throughout our excavation, has yet to be studied in detail. Nonetheless, datable finds from our excavations, such as stamped Rhodian amphora handles, a Tyrian lead weight of the Tanit series, and a didrachm of Ptolemy VI suggest a Hellenistic occupation from the end of the third century BCE to 142 BCE. 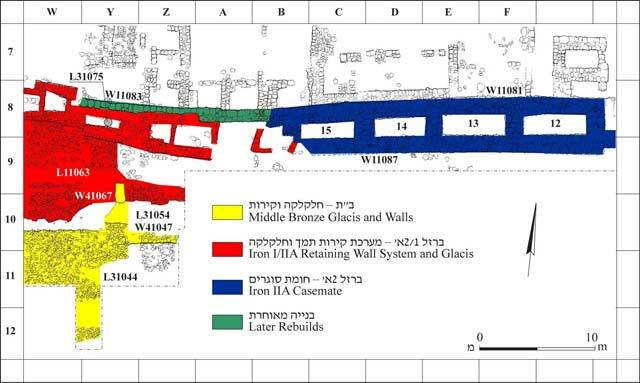 Major results from the first four excavation seasons include the exposure of the Middle Bronze Age glacis; the discovery of a Late Bronze Age stratum, consisting of several wall fragments and a large pillar base that probably indicates the presence of a major public structure; the clarification of the Iron Age fortification systems; the distinguishing of three major architectural strata from Iron II; a large Israelite four-room house and three public buildings that were destroyed in the eighth century BCE, probably as a result of Tiglath Pileser III’s campaign in the region; and the excavation of three Hellenistic building complexes. Future excavation seasons will hopefully supplement and clarify our understanding of these results. 2. Area A, Late Bronze II pillar base, looking east. 3. Area A, aerial view of Public Buildings A–C, looking north. 4. 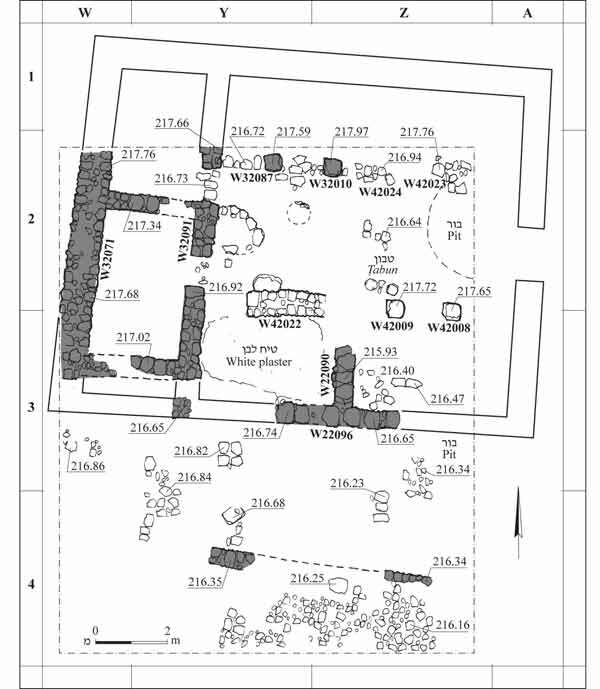 Area B, the Iron Age four-room house, plan. 5. Area B, the four-room house, looking west. 6. Area B, destruction layer of the four-room house, looking northeast. 7. The Hellenistic stratum, reconstructed plan.